We have round golf pencils with or without erasers. You also have your choice of printing your 1 color logo or 3 lines of personalized text printed in plain or script font. Available in 9 standard colors and a variety of print colors. The pencils are 3 1/2 inch long. Printing Methods: Prices include one color imprint (no setup charges). Specifications are listed on each item. Type Fonts Available: Arial, Times New Roman and Comic San MS. Specify CAPS, upper/lower case on round golf pencils. We will copy and paste from you order (check your order for accuracy). Art by E-mail: Send to Email Us The subject line of your email should include customer name and order number. We can not use art from Word documents or faxed art. Methods of Payment: We accept Visa, Mastercard. Website Images: Pictures of products and colors are representative and may vary slightly due to how computers and monitors display images. Shipping: Orders are shipped via UPS ground. Freight will be prepaid and added to your invoice if applicable. We must have a street address. UPS cannot ship to P.O. Boxes. Returns: All returns must be pre approved! Returns must be in original packaging and complete sellable units. Imprinted items are not refundable. Shipping costs if applicable are non refundable. Privacy: Pencils 'n More does not share ANY information about our clients with anyone! RW School Supply is one of the leading distributors of promotional products, such as personalized golf pencils around the world. 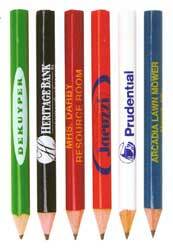 Our imprinted golf pencils have helped to increase customer loyalty for businesses across the country! Pencils & More is a great place to find specialty, designer, and custom printed pencils at an affordable price. You can even customize your golf pencil on the screen with your text, logo, or mascot.